Meet Warren Frederick Ingrey, who on Tuesday, December 15, 1953, having just attained the minimum school leaving age of 15, started work as an apprentice typewriter technician at Chartres-Remington at the corner of Nithsdale and Liverpool streets in Sydney. Yes, folks, that's almost 63 years ago, and Warren, at 77, is just as nimble at a manual typewriter keyboard today as he was back then. Sat at a Remington 17 at yesterday's weekly gathering of the Sydney Typewriter Appreciation Exchange, Warren instantly tapped out a nice little piece of typewriter art - a sergeant-major at the head of a line of eight foot soldiers. I guess in time the quorum of a STAX meeting will rise to nine, but in the meantime I have taken the liberty of filling a few gaps with the names of those who were there yesterday in spirit only. But we all are, in flesh and bone or otherwise, marching forward together in the cause of the Typewriter Revolution. From left, Phil Card, Philip Chapman, Warren Ingrey, host Richard Amery and Terry Cooksley were among those who attended yesterday's weekly STAX meeting in Sydney. Warren's typewriter technician career extended to 42 years. 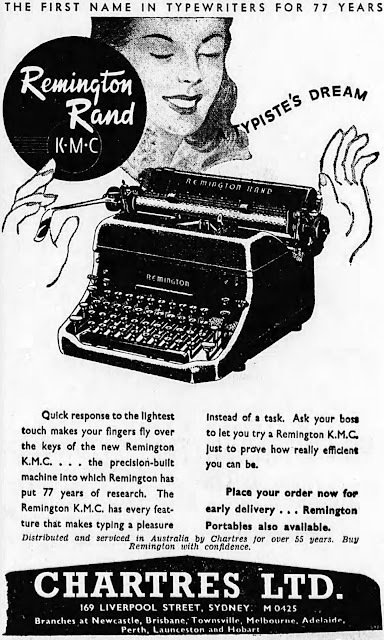 By the time Remington Rand had moved to 3 Park Road, Alexandria, in Sydney, he had risen through the ranks to be the typewriter division's superintendent. He left Remington in 1982 to join Adler Business Machines on the corner of Waterloo and Lane Cove roads, North Ryde, where he remained for another four years. Then in 1987 Warren went to work for the Commonwealth Bank of Australia at its Sydney headquarters on the corner of Pitt Street and Martin Place, Sydney. He was given his own workshop to service the CBA's manual typewriters - mostly Olivettis and Adlers - and stayed with the bank for eight years, until 1995. Warren joined Chartres at a time when it was pushing the same model of Remington standard manual typewriter that he so adeptly used at yesterday's meeting. This ad is from The Sydney Morning Herald. Meeting host Richard Amery had loaned this Remington 17 to a Sydney film company. When the company gave it back to him, he found that, without consulting him, it had painted the machine black from a light green - some gratitude! When Warren joined the CBA, he found the man who had previously held the job there had used a tub of kerosene and a vaccum cleaner to clean out typewriters. Warren promptly got in some proper equipment, such as a typewriter washing machine and a lathe. Although Warren serviced typewriters from all CBA branches, by the early 90s the workload was starting to lessen because of the advance of "new technology". "I'll never forget the words one manager used one day," Warren recalled yesterday. "He came to me and said, 'Warren, we don't know what you do, but we do know you do it very well!'" Warren was born into a typewriter technician family, in Marrickville in Sydney in late 1938. Two of his uncles, Jack and Fred Ingrey, were in the industry, and Warren himself had been "playing around with typewriters" long before he started working for Chartres. These days, however, he prefers a game of lawn bowls to working with typewriters. Still, he very clearly hasn't lost one iota of his touch with the Wondering Writing Machine. Phil Card and myself in the process of trying to find the elusive "jewel" in a Smith-Corona Galaxie II escapement wheel. You will have to get the next ETCetera magazine to find out all about it. When I posted on my first visit to these weekly gatherings in Sydney, a month ago, I expressed a doubt that I'd be able to get back there on a regular basis, as much fun as they undoubtedly are. Richard Polt commented on the post by saying he hoped I'd manage at least a monthly return. Well, that's how it has turned out - so far at least. A week or so ago I wasn't expecting to be back at Richard Amery's home again so soon, but the prospect of meeting Warren Ingrey for the first time was a great incentive. And it turned out to be well worth the effort. * If a keychopper asks for forgiveness and to be allowed to convert back to the good side, can she ever be fully redeemed for her sins against the machine? Shall we admit her to the fold? There was considerable discussion on this rather vexing and pressing matter. * The typewriter trade in Sydney as it once was, including the rebuilding of typewriters. * Early uses of the @ and other keyboard symbols. * Where is the jewel on a Smith-Corona Galaxie II? Read the next edition of ETCetera to find out. Phil Card and Terry Cooksley exposed the bejeweled truth in the Galaxie's escapement wheel and loose dog as they demonstrated the machine's inner workings. * Is there really life after typewriters? And how truly miserable can it be? * How to fix the platen turning mechanisms on Torpedo/Blue Bird Series 15, Remington Noiseless and Olivetti ICO MP1 portable typewriters, courtesy of that mechanical genius Phil Card. * Does a Depression Era Royal Junior have two paper fingers or just one? And if the answer is two, where can one find a replacement, please? * Is this really the margin release key on a Danish keyboard Triumph Durabel sold in Stuttgart and serviced in Copenhagen? * Has this Underwood 5 been (at least partially) repainted? And if so, by whom? * Why is a red Corona 3 Special cause to break out the cupcakes? 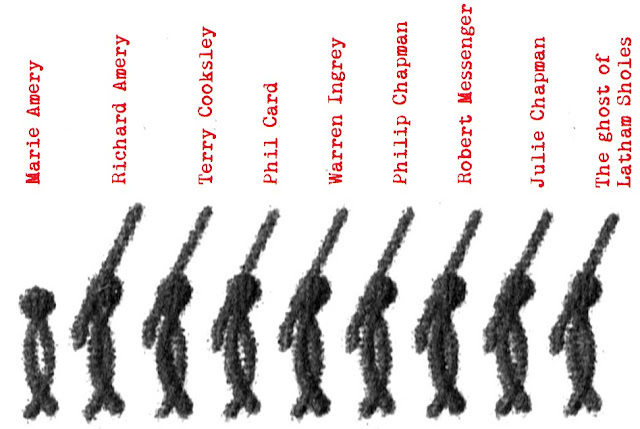 * Did anyone ever truly believe Richard Amery only collected and used Imperial Good Companions? Not a chance! * And how do you type a line of eight soldiers holding rifles? Just to pick out one thing: "Typiste"?